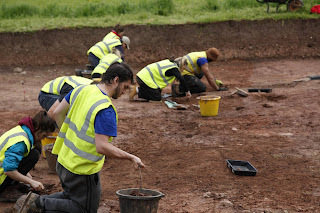 As week two draws to a close, we look at some of the great finds uncovered so far this season. We’ve reached the Roman level, planned and levelled the site, and even found a beautiful Roman brooch. By extending the trench, we've uncovered part of a Georgian garden and a musket ball that probably fell through demolished houses during the civil war. 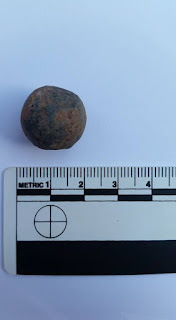 Along with this musket ball, there were at least fifty pistol shots, evidence of a shoot-out by the church and tower walls, tying the archaeology to the civil war battle that occurred at Berkeley, between the Royalists and the Parliamentarians! Written accounts from Prince Rupert to Coronel Rainsborough on 23rd of September 1645 note the siege of the castle, taking it for the Parliamentarians (Wroughton, 2000). National Geographic Journalist Andrew Lawler comes to Dig Berkeley. As a special Friday treat Andrew Lawler, a writer for National Geographic and an award winning independent journalist visited the site. We were given the rare opportunity for some Q&A as well as finding out about the world of global media. 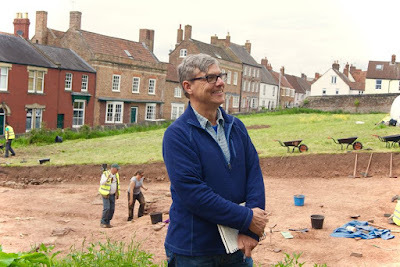 It was a good chance for members of the engagement team to meet such a relaxed man, who was more than willing to answer questions surrounding journalism and its application to archaeology. Day four in to the Berkeley dig, and we’re getting into the good stuff! As we begin to remove the last of the Tudor walls, and the remnants of the Roman road, we’re starting to discover the really bright orange level of the Romans. This is being meticulously drawn and recorded under tutelage, with excavation pits popping up as we get to see the varying colour changes from cleaning. All these will have their levels taken so that we can understand the stratigraphy in relation to other features. As mentioned in yesterday’s blog, the cut of the gully has now been planned which means that all the documentation of the stabling block has been finished! The west side of the section has been pushed further back showing more evidence of the medieval buildings in the far corner has appeared. A drainage system stretching further towards the modern road, and a wall running between these buildings and the stables, is also visible. In June 2014, Bristol archaeologists uncovered the remains of a Tudor building, and after consulting Berkeley Castle historical records, we now know that this tavern was called “The Crown Inn”. It was thought that this tavern was flattened in the civil war, to protect the castle and this guess was supported when a lead powder cap and a musket ball both were uncovered in 2015. There's lots in store for the Berkeley crew this year! The team has been going at break neck speed; cleaning the surface of the trench. Section edges are being polished off, photographed, and drawn meticulously. This is all in preparation for an exciting new extension to the western side of the trench. We hope to uncover some pre-14th century (possibly Norman) buildings. These have been hinted at through the discovery of what might be drains and walls. This would further enrich this already dense site, so fingers crossed! The extension might even uncover the old path of the Berkeley high street. The theory is that during the building of the wall that currently forms the boundary between Nelme's Paddock and High Street, the Berkeley Estate may have encroached on to High Street, effectively making the area of the paddock larger than it should have been. This would explain why the wall curves and does not match the alignment of buildings further up the road. It’s finally come around! The Berkeley Castle excavations are back for another year and we have just started our first official day. We are beginning to get back up to speed, our 1st years have been given their obligatory tour of Berkley Castle and are now back in Nelme’s Paddock de-weeding Trench 8. 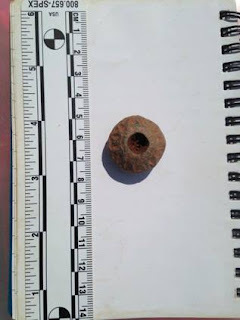 During the clean, our Archaeo-metal detectorist Pete Twinn found a weighty lead spindle whorl dating to the Medieval period. This came from the building complex that fronted onto the High Street, however until the full clean-up has finished we are unclear which phase this find belongs to. A spindle whorl is a disc of spherical object that is used in the spinning of cloth. It fits into the spindle and acts as a weight to increase the speed and constancy of the spin.